Owning a giant mass media empire remains one of the major paths to vast wealth in the Philippines. This is apparent in Forbes magazine’s 2018 list of 50 richest people in the Philippines, which included major shareholders of the country’s two leading television broadcasting companies. 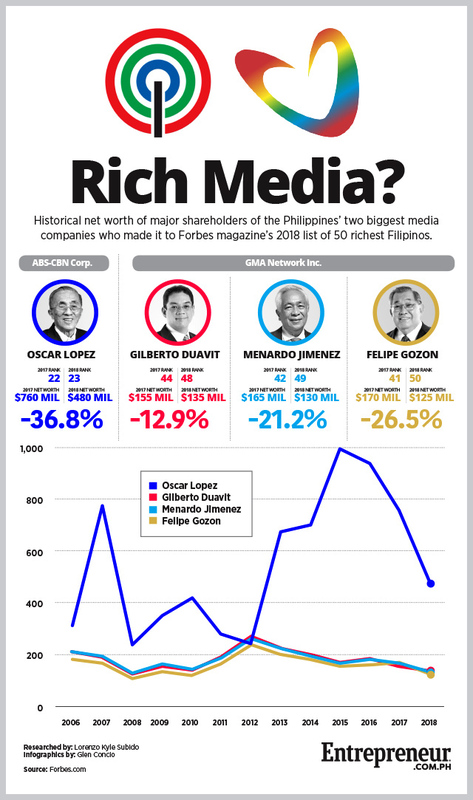 Oscar Lopez, a director of ABS-CBN Corp., and Gilberto Duavit, Menardo Jimenez and Felipe Gozon, who are co-founders of GMA Network Inc., all made it to this year’s Philippines’ 50 Richest list. But a weak earnings performance in the first half of 2018 at both ABS-CBN Corp. and GMA Network Inc. have taken their toll on the two listed companies’ share prices at the stock exchange. That, in turn, hurt their major owners’ net worth and their Forbes rich list rankings. Of the four, Lopez, who is also chairman emeritus of ABS-CBN’s parent firm Lopez Holdings Corp., suffered the biggest drop in wealth. His current $480-million net worth is 36.8 percent less than a year ago. His wealth has been on the decline since 2015, when it hit an all-time high of $1 billion. The three GMA founders experienced similar but lower declines in net worth this year. Gozon, who sits as GMA’s chairman and CEO, saw the biggest drop in fortunes among the three, as his wealth is 26.5 percent less compared to last year. Jimenez experienced a similar 21.2-percent drop in wealth, while Duavit saw the smallest decline at 12.9 percent. The drops in the four executives’ wealth aren’t unexpected. Share price of ABS-CBN stood at Php24.80 in August 24 (the date Forbes used to compute for the tycoons’ net worth), a 40.5-percent loss year-on-year. GMA’s shares experienced a 10.1-percent drop in the same period, closing at Php5.50 that day.